It’s tough to know how frequently to write an update on Elias Pettersson. If I wrote about him every time he scored a nice goal or had a big game, Pass it to Bulis would pretty much cease to be a Canucks blog and would simply become an Elias Pettersson blog. This seemed as good a time as any: it’s the halfway point of the Swedish Hockey League regular season, with a brief break in games until December 19th. The SHL season lasts 52 games and most SHL teams have played 26. So has Elias Pettersson. In those 26 games, Pettersson has 11 goals and 35 points. If he had put up those point totals over a full season, that would have been impressive. A 35-point season would have exceeded expectations and there’s still another half a season to go. Already, Pettersson’s season is among the all-time greats from a junior (under-20) player in the SHL. His 35 points is 13th all-time and he just needs three more points to step into the top-10. 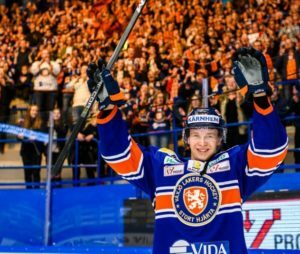 When he does, he’ll join Thomas Gradin, Markus Naslund and the Sedins: seven of the greatest junior seasons in SHL history will belong to Canucks. But Pettersson isn’t just on-pace for a top-10 all-time season; he’s on-pace to be top-two. Pettersson’s 1.35 points per game trails only Kent “The Magic Man” Nilsson in all-time points per game from a junior in the SHL. Not only is he right behind one of the greatest Swedish hockey players of all time, he’s ahead of arguably the greatest: Peter Forsberg. It’s entirely possible that when Pettersson’s season ends, he’ll have the most points in SHL history from a junior player. He needs 20 points in the second half of a season to pass Kent Nilsson’s 54, which seems doable. His own excellence might prove to be an obstacle, however. Pettersson will obviously be on Team Sweden for the World Junior tournament, but he’s also a candidate to play in the Winter Olympics in Pyeongchang. In fact, it would seem absurd if the SHL’s leading scorer was eligible to go to the Olympics didn’t make the roster. That means Pettersson will miss at least four games during the World Junior tournament, possibly more if he’s required to be in any pre-tournament camp or games. The tournament runs from December 26th to January 5th. The SHL will take a break during the Olympic tournament, which runs from February 14th to 25th. Vaxjo does have a game on the 25th, the same day as the gold medal game, so if Sweden goes deep into the medal round, Pettersson would miss at least one game. Just like with the World Junior tournament, he might miss more game if he’s required to go to a selection camp or play in pre-tournament warm-up games. At his current pace, Pettersson will need to play in 41 games to reach 55 points. With the games he’s likely to miss (and the one game he already missed with a minor injury), it will be tight. There’s also the question of whether he can keep up this pace. Pettersson currently has a 17.74% shooting percentage, which is unusually high. It’s the sixth highest shooting percentage in the SHL. So, if Pettersson’s shooting percentage regresses, his scoring pace could slow down over the second half of the season. There’s reason to believe that it won’t regress, however. Pettersson’s shooting percentage in the Allsvenskan last season was a nearly identical 17.76%. Certainly, the Allsvenskan is a lower tier league, with likely a lower caliber of goaltending, but it’s enough to suggest that Pettersson has legitimate shooting talent that can carry a higher-than-average shooting percentage. He also hasn’t been getting lucky with any of his goals. Scott Wheeler at The Athletic broke down Pettersson’s goalscoring this season (warning: paywall) and noted how his goals have come courtesy of his devastating one-timer, accurate wristshot, and quick hands around the net. He’s not scoring off crazy deflections or fortunate bounces: he’s scoring via skill. In addition, Pettersson isn’t dependent on his goalscoring ability to rack up points. He leads the SHL in assists per game for a reason: his vision and playmaking are off the charts. He didn’t need to score a goal to put up four points against Färjestad BK: he just assisted on four of the Lakers’ five goals. Some might question whether the SHL is a physical league and whether Pettersson will continue to produce when he comes over to North America. Two of his four assists in that game came after he was knocked to the ice along the boards. The SHL is a physical league and Pettersson gets hit: he just doesn’t let it stop him from piling up points. Another reason why Pettersson might be able to keep up his pace is that he’s gradually been given more rope by his coach, the wonderfully foul-mouthed Sam Hellam. Pettersson is averaging just 16:24 in ice time this season, much less than most of the other leading scorers in the SHL. Throughout the season, however his ice time has been trending upward. Since late October, Pettersson’s 5-game average in ice time has stayed steady at or above 17 minutes per game. Over his last five games, Pettersson is up over 18 minutes per game. With that boost in ice time, Pettersson will get more opportunities to keep up his scoring pace. The Växjö Lakers are currently leading the SHL by nine points, largely thanks to Pettersson’s outstanding season. Pettersson has 12 more points than the next highest scorer on the Lakers, so he hasn’t been carried by his teammates. If anything, the opposite is true. If he’s good in comparison to his teammates and the rest of the league, he’s incredible in comparison to other junior players. The next best under-20 player is Lias Andersson, who has 7 goals and 14 points, 21 fewer than Pettersson. Let’s be clear: this is a great season for Andersson, who the New York Rangers picked 7th overall in 2017. It’s the type of season that we could have reasonably expected for Pettersson and one that strongly suggests a good NHL future. And it pales in comparison to how Pettersson is actually performing. With the SHL season temporarily on hold, Pettersson has continued to score in Champion’s Hockey League action, scoring the game-winner against the Swiss champions SC Bern, who feature several former NHLers, including Mason Raymond, Mark Arcobello, and Andrew Ebbett. Pettersson’s goal was gorgeous, as he took advantage of some space and ripped a wrist shot into the top corner. Pettersson combines elite play-making ability, high-end shooting talent, and incredible intelligence, making him one of the best prospects in all of hockey. Yes, it’s okay to be excited.